Eco Seal® Series products are closed-cell foam tapes specially designed for sophisticated industrial, automotive, medical and construction applications. 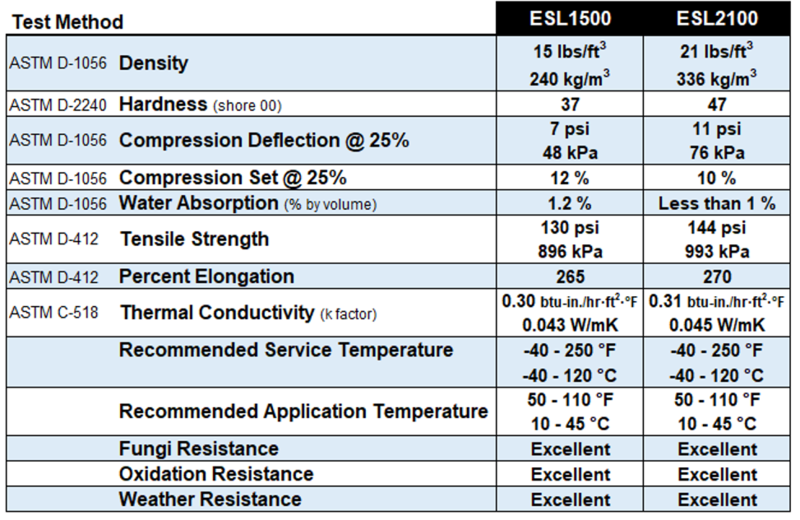 ESL1500, medium density foam exhibits greater dimensional stability, cushioning properties and vibration dampening qualities. Test results demonstrate that ESL1500 can be classified to 2C2 (SCE-42) as specified by ASTM D 1056 and SAE J18. ESL2100, heavy density foam exhibits excellent physical properties, abrasion resistance, as well as vibration reduction. Sound deadening and cushioning characteristics are also enhanced. ESL2100 competes with heavy density urethane in some applications. Test results demonstrate that ESL2100 can be classified to 2B3 (SCE/SBE-43) as specified by ASTM D 1056 and SAE J18. Characteristics common to all Gaska Tape flexible closed-cell foam products include the ability to make a long life seal against air, moisture, light and dust penetration. Eco Seal® Series foam completely seals out air, moisture, light and dust when compressed 30% or more. With a service temperature from -40°F to 250°F, it’s an excellent product for protection of materials over these broad temperature ranges.